RIO DE JANEIRO, BRAZIL – The SuperVia train system which is comprising a hundred stations in eleven cities around Rio de Janeiro state, and carries more than 650,000 people per day, has been putting new rail cars into use. The State Government, through the Secretary of Transportation, inaugurated on Saturday (March 21st), the sixtieth of a hundred new trains imported from China. The State Government inaugurated the sixtieth of one hundred new trains imported from China, photo by Clarice Castro/IMPRENSA RJ. According to government press, each new rail car can carry 1,200 passengers and will add 12,000 seats to the daily supply of the rail system. A series of derailments and accidents over the last couple of years have led to a public outcry and protests about the lack of maintenance and investment in the transportation system which services over an estimated half-million daily commuters. For the State Transportation Secretary, Carlos Roberto Osorio, the delivery of the new train is a further step for the rail system in Rio de Janeiro. “This is a very important day. There are over 12,000 spaces daily for train users. We expect to deliver over forty new rail cars by the end of the year and have all the renewed fleet by next year,” said Osorio. The new train is equipped with air conditioning, inside passage between the cars, a system that prevents the opening of doors during travel, internal safety circuit, porterage, broader and interiors, and LED panels. 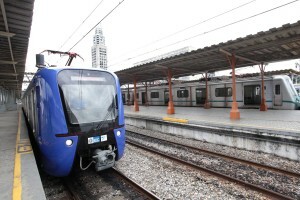 The new rail cars are part of the revitalization of the Rio railway system, which brings together a state investment of US$472 million, financed by the World Bank. The process began in 2012, when the first thirty rail cars manufactured in China started to come into circulation. That year, the state acquired a further sixty Chinese trains, and at the end of 2013, the purchase of ten more trains was carried out. Governor Luiz Fernando “Pezão” (Bigfoot) attended the opening and toured the Central do Brasil – Bonsucesso rail connection in the new train. From there he traveled to the cable car accessible at the Alemão station, where he met with approximately twenty community leaders of Complexo do Alemão and walked the streets of the community to foster more interest in the Teleférico gondola transportation system set up there in July of 2011. “We are committed to the communities, especially by ensuring the safety, and we are working hard at it. Everyone wants peace, no worker wants to see his son [give up to drug] trafficking. This is the desire of all of us. No police have orders to enter the community with violence. Nor do we want our police officers attacked or murdered,” said the governor. These comments come at a time when violence in the Zona Norte (North Zone) favela community has escalated and police have been targeted at an increased rate. During the conversation with community leaders, topics such as health and education were also addressed. SuperVia is a private operator in Rio de Janeiro, founded in November 1998 and awarded the transportation concession until 2048. It carries over 650,000 passengers per day between a hundred stations in eleven cities: Rio de Janeiro, Duque de Caxias, Nova Iguaçu, Nilópolis, Mesquita, Queimados, São João de Meriti, Belford Roxo, Japeri, Paracambi, and Magé.